On November 23, the Chinese University of Hong Kong at Sha Tin, Kowloon was bathing in the sun. The green trees, well-spaced buildings and the surrounding mountains and sea make the University one of the most picturesque campus in Asia. 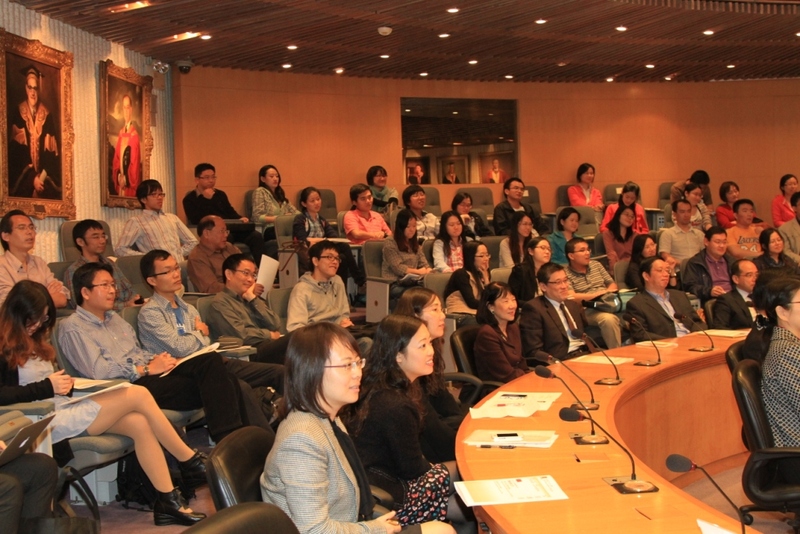 Ambassador Liu Xiaoming, who was visiting Hong Kong as a guest of the Hong Kong SAR government, arrived at the Cho Yiu Conference Hall, the executive office building of the University, and gave a lecture to the teachers and students. 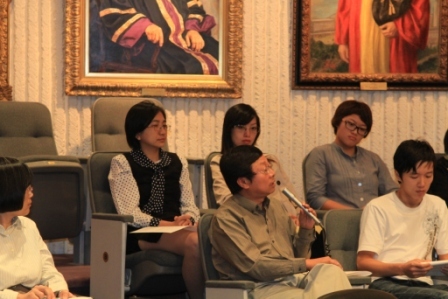 Being a round lecture hall, Cho Yiu Conference Hall is named after Sir Cho-Yiu Kwan, the first Chairman of the University Council. Surprisingly, it is also the Chinese first name of the current Vice Chancellor Professor Joseph Sung. On the surrounding walls of the Cho Yiu Hall there were the oil painting portraits of the former Chancellors and Vice Chancellors, including Nobel Physics Prize laureate and former Vice Chancellor Sir Charles Kuen Kao. Above the school insignia in front, there hang the big background board specially made for Ambassador Liu's lecture. As over 120 teachers and students arrived early, the venue was packed. After the introduction and welcoming address of Vice Chancellor Professor Joseph Sung, Ambassador Liu delivered a speech entitled "A New Partnership: China and the West". 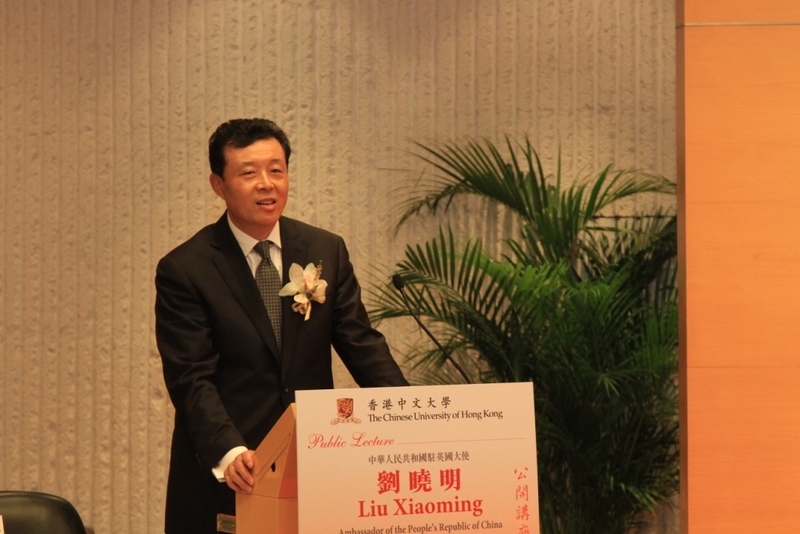 Ambassador Liu said that this was his first time to give a speech at a world top 100 university in China and in Chinese. He felt proud at the rostrum of the prestigious British universities, but was even more proud at the rostrum of a top-class university in Hong Kong and in China. 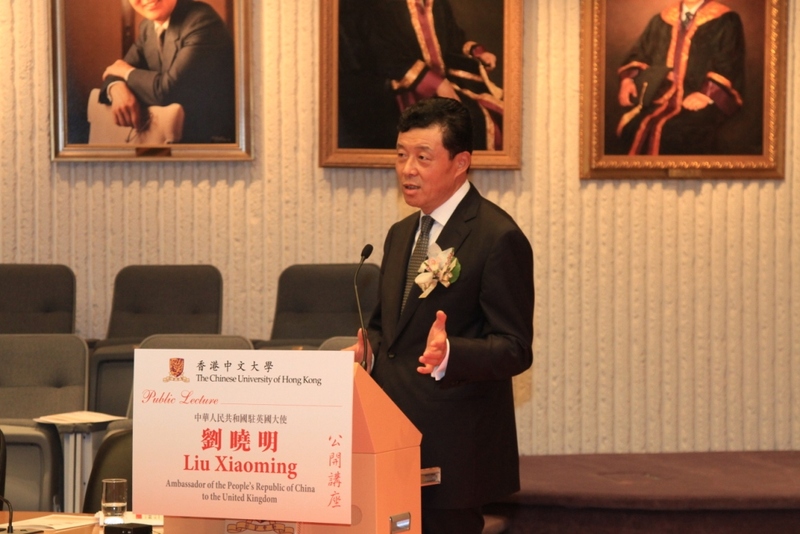 Ambassador Liu congratulated the "post-60s" Chinese University of Hong Kong on its success in becoming one of the top 50 universities around the world within less than 50 years, and wished that the universities in Hong Kong would have an ever rising status among the global institutions of higher education. Ambassador Liu's warm and humorous opening remarks immediately bring him closer to the audience. Ambassador Liu then looked back on the drastic changes in the China-West relations over the recent 100-odd years. He pointed out that China today has developed into a strong country and is no longer the "Sick Man in East Asia". With the handovers of Hong Kong and Macau, the history of inequality between China and the West has been completely rewritten. Meanwhile, China and the West are having increasingly closer trade and economic cooperation, unprecedentedly active people-to-people contacts and exchanges and strengthening consultation and coordination in international affairs. The Ambassador stressed that China pays great attention to the development of the relations with the Western countries and put it in an important position in the country's overall foreign policy. In recent year China has constantly enhancing its comprehensive strategic partnership with the UK and EU, and has been committed to building a partnership based on mutual respect and mutual benefit with the United States. Ambassador Liu also pointed out that the China-West relations are not always in a stable development process, with disagreements and conflicts arising from time to time. This is due to two reasons. The first is about the mentality of the West. As they are not accustomed to China's development, Western countries have growing concerns and anxiety and as a result, they have put forward the "China threat theory" and the "China responsibility theory" in recent year to both "club and puff China to death". The second reason is that the West cannot properly deal with the "differences" between China and the West. It is always measuring others with its own standards and trying to impose its own theories to others. Ambassador Liu then put forward three key suggestions to properly handle the China-West relations: First, the West needs to adopt a positive view on China's development and see it as an opportunity rather than a threat, so as to reduce unnecessary worries. Second, strengthen the exchanges and communication among the general public to help the Western people know more about China, China's modernization and progress and China's status as a developing country. Third, properly handle differences. Ambassador Liu took the systems of Apple and Microsoft as an example and stressed that incompatible as they are, the two systems develop along different roads, constantly release their updated versions and have both made remarkable achievements. Today's China-West relations should also be like this. The Ambassador's illustrative explanation made the audience nod in agreement. Ambassador Liu further quoted the main ideas in the white paper entitled "China's Peaceful Development" to make a broader conception on the relations between China and the West. He emphasized that to build the China-West relations in the future, we need to both follow the general development trend of human society and match with the times. We must learn both the lessons of human civilization and the essence of the traditional Chinese culture. Ambassador Liu pointed out that the new relations between China and the West have three basic elements: The first is peaceful development, which means to completely abandon the "Cold War mentality" and break the historical experience of "strength leading to hegemony" to achieve coexistence and common prosperity in peace; The second is development by cooperation. China and the West can constantly expand cooperation areas in healthy competition and work together to seek for mutual benefits and a win-win situation. The third is harmonious development. China and the West need to respect each other and treat each other equally. We need to tolerate each other, seek common grounds and learn from each other. Finally, Ambassador Liu said that just as the optical fiber technology invented by Sir Charles Kuen Kao has brought the world closer, China and the West are today near at hand to each other. Both sides should reach out their hands and hold together to truly become partners and honest friends and to build new relations between them together. Ambassador Liu's speech received prolonged applause from the audience. 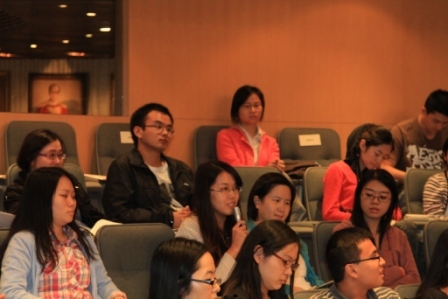 To the teachers and students in the Chinese University of Hong Kong, who were eager to learn the first-hand information on the national diplomacy, the arrival of Ambassador Liu was undoubtedly a rare opportunity. They enthusiastically raised questions, making the Q&A session extended again and again. A girl student asked how China could maintain a good relation with EU without compromising its own economic interests and development in the current intensifying debt crisis in Europe. Ambassador Liu replied that as EU is the world's largest conglomerate of developed countries, its coming out of the debt crisis will undoubtedly play an important role in the world economic recovery and growth. To tackle the debt problem in Europe, on one hand China has stressed that the solution to an issue in the EU relies mainly on the EU itself and has been supporting the efforts of the EU and the International Monetary Fund in response to the crisis to encourage the EU's confidence in overcoming difficulties; and on the other hand, China is strengthening its economic and trade cooperation with the EU countries and particularly expanding the imports from and investment in these countries so as to promote their economic growth. For example, the UK's exports to China grew over 40% last year and have maintained a growth of over 30% in the first three quarters of this year; China's investment in the UK has also been growing fast in the recent two years. The two sides are expanding the investment cooperation in infrastructures. A scholar asked: recently it was reported that, China listed three conditions in exchange for bailing out Europe, namely the EU's recognition of China's full market economy status, lifting of the arms embargo and support in increasing China's share and voting rights in international financial institutions. Is this true? Ambassador Liu replied that this exchange of interests even does not sound like China's diplomatic style. It does not like what a big country should do but a deal between businessmen. Ambassador Liu's wit answer caused laughter. He then made a detailed analysis on the origin and essence of the three issues, emphasizing that the first two issues should have been resolved long ago and the EU should make a wise political decision as soon as possible; The last issue involves not only China but also a number of emerging economies. The reform in the international economic and financial governance mechanism should reflect the changes in the international economic situation and gradually expand the voice of the emerging economies. 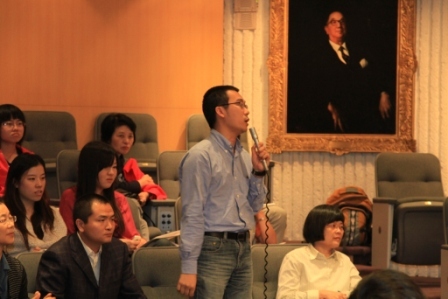 A student asked how to see the role of NGOs in the China-West relation. Ambassador Liu said that in the UK there are a lot of NGOs committed to promoting the China-UK relations, such as "CBBC", "48 Group Club", "Chopsticks Club", etc. The Ambassador himself often attended and addressed the events held by these organizations. The Ambassador than pointed out that the relations between China and the West is not only the relations between the governments, but is more importantly the exchanges and friendship between the peoples. Only when the Western people know more about China can they promote their governments and parliaments to pay more attention to the development of their relations with China. 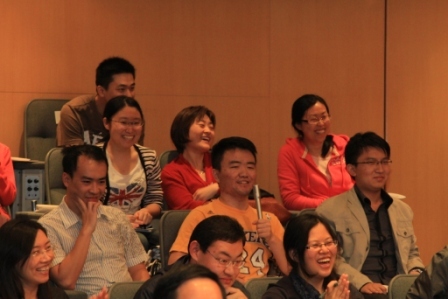 At present, China and the UK are preparing for a senior people-to-people exchange mechanism. One of its underlying ideas is to expand the exchanges between the peoples under the guidance with the governments, so as to promote the cooperation in education, culture, sports and other fields. In this mechanism NGOs can absolutely play a greater role. 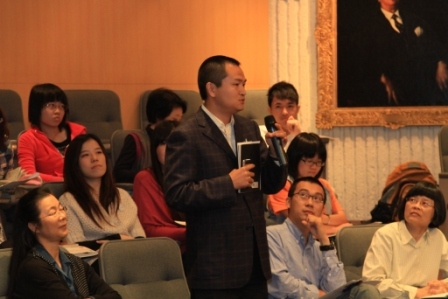 A professor asked what role can be played by the Chinese University of Hong Kong in building the new China-West relations. Ambassador Liu said that Hong Kong is backed by the Mainland and facing the world. In the past, Hong Kong was China's window to the outside world and channel of foreign exchanges. Today, Hong Kong can still play a role of bridging the economic and trade cooperation between China and the West. It can serve the Chinese enterprises "going global" and help the medium sized and small enterprises in the West to invest in China. At the same time, Hong Kong is a place bringing together Chinese and Western cultures. It both allows the West to make up for the lack of knowledge on China and China to learn the Western trend. So Hong Kong is also a cultural bridge between China and the West. The Chinese University of Hong Kong works to "combine tradition with modernity, and to bring together China and the West". With its unique education of "Bi- literacy and Tri-lingualism", the University is increasingly internationalized. The Ambassador hoped that the Chinese University of Hong Kong can make good use of its exceptional advantages to become a prestigious university connecting China and the West. Ambassador Liu also answered the questions on the RMB exchange rate, the exchanges and learning in judicial areas between China and the UK, the comparison between the images of Chinese and British officials, etc. Ambassador Liu's impressive speech and wonderful answers both reflect the sincerity of a Chinese diplomat and perfectly elaborate China's diplomatic vision and practice. It is a lecture on diplomacy as well as the national conditions. 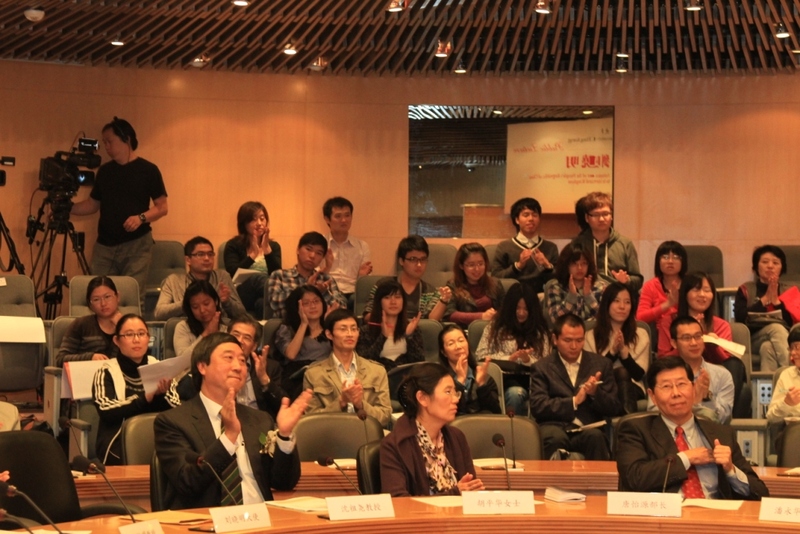 Thus, from the enthusiastic applause at the end of the lecture, it is not hard to feel that the faculty and students of the Chinese University of Hong Kong are expressing not only their sincere thanks to Ambassador Liu but also their keen expectation on Chinese diplomacy and their great hope in China's future development.